Now you can quickly and easily modernize your iSeries reports with Microsoft Excel with the iSeries. This hands-on training shows you the work-a-day techniques that will save you time and keep your users happy and productive. It comes with an illustrated manual and a CD containing all the exercise source code, a complete Excel workbook with buttons to run queries and a sample user request workbook for creating clearly defined user requests that will make your job easier. How to get any file into an Excel spreadsheet. How to use Query/400 to filter what records to put into Excel. How to use the AS/400 IFS to copy information into Excel. How to call programs on the iSeries from your PC using RMTCMD. How to use Visual Basic in Excel to run a program on the iSeries and open the results in Excel. How to pass parameters to called programs on the iSeries right from Excel. How to modify fonts, column widths, lock titles, set formatting and more . . . all automatically, once an iSeries file is opened in Excel. 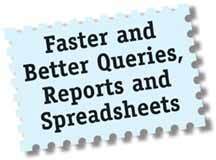 How to build Query/400 queries and never have to change them again to select different date ranges. How to click a button in Excel and open other PC programs, other spreadsheets, even web-sites. If you have iSeries Access (Client Access) and Microsoft Office you already have everything you need. Note: This is practical training developed in a real iSeries working environment and used on a daily basis. Order Microsoft Excel with the iSeries now!